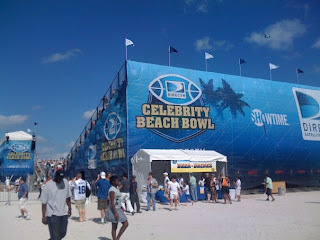 Today I started the day with the DirecTV Celebrity Beach Bowl. This started off a bit of a cluster, but sure enough we got in with relative ease. I went with my brother and a group of his friends. We could hear the players getting announced as we rolled into the venue. "Who's Michael Clarke Duncan?" asks my brother. "The guy from the Green Mile," I replied. "Well, why didn't they just say so," he said. LOL. Yeah, it was going to be one of those days. We find seats in the stands and we're waiting for the "game" to begin. Suddenly every 13 year old girl starts screaming and heading for the railing. I can't figure it out. I think to myself, maybe it's a Jonas Brother or something. I overhear my brother telling his friend, "It's that guy from Twilight. His name is Taylor. He dates Taylor Swift." ARE YOU KIDDING ME?!?! Why does my brother know who that Taylor kid is, but yet he didn't know who Michael Clarke Duncan was?!?! What is this world coming to? I take the obligatory pic of the kid and then start chatting it up with Peter, my brother's sailing friend and hopefully a new TheWirk.com devotee. By now there's a guy a few rows behind us, and he's getting frustrated that all the teenage girls are standing in front of us. He starts yelling at them to sit down and eventually they do. Next thing you know it's time for Brian McKnight to sing the national anthem and everyone stands up again. Sorry guy, you lose again. Seriously though, people like that I'll never understand. If you don't want the people in front of you to stand, make sure there's no one in front of you OR feel free to use your legs and stand up also... Simple solution to a simple problem. That's right, I solve problems. 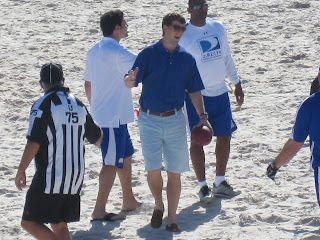 Eli Manning coached a team and Mark Sanchez coached another one. Good to see one Manning today and the better Manning tomorrow. Game ended and we all took to the sand for a concert by the All American Rejects. Not bad... I managed to work (i.e. WIRK ~ wink wink) my way up to about 4 "rows" from the stage to take in the show. They played several of their songs, and I recognized a few of them. 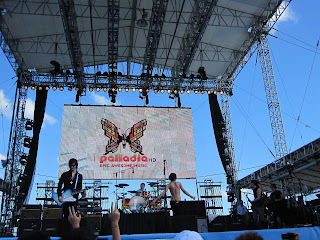 "Gives You Hell" was their last song, before we all started heading back to the madness of Ocean Drive. 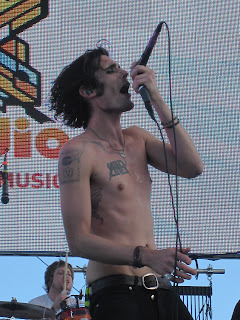 All American Rejects concert anyone? Ocean Drive is already a scene in Miami. Block off car traffic and add a Super Bowl and you have plenty of foot traffic! Ocean Drive is basically Bourbon Street "light" right now. Don't believe me? Get on twitter and see for yourself. I even retweeted (is that even a word?!?!) the following from OchoCinco ~ "OGOchoCinco Wtf! Is this Mardi Gras or a superbowl game, the entire city of new orleans has taken over south beach, all I see is black n gold" He isn't kidding. Good luck finding a Colts fan out there! We walked down Ocean Drive and headed to Lario's. I love Lario's ropa vieja. Every time I come to South Beach, I go there. Say whatever you want about it ~ I love it! The meat is excellent and the plaintains are so sweet. They remind me of the fried bananas, my grandma made for me in the Philippines. On the way to the restaurant, my brother informs me that some creepy old guy was staring at me as I passed him, and he defended my honor. Yeah, thanks. $10 says it's the guy that greeted me with, "Hola" as I walked by. This is South Beach, and just because I'm brown DOESN'T mean I speak Spanish. Just saying. After dinner we all disbanded, and I never made it out again. I need to rest up! I have a big day tomorrow, with my FIRST Super Bowl!!! Ok - it's today... I really need to get to sleep!!! I just scored my ticket to the Super Bowl!!!! UNC and Coach Williams can only go UP from here!